Halford Ryan, Professor of English and Speech Emeritus, Dies at 74 Ryan taught at Washington and Lee for 40 years until his retirement in 2010. Halford Ross Ryan, professor of English and speech emeritus at Washington and Lee University, who taught here for 40 years until his retirement in 2010, died on May 15, 2018, in Lexington, Virginia. He was 74. Ryan was born on Dec. 29, 1943, in Anderson, Indiana. He graduated from Wabash College in 1966 with an A.B. in speech and religion, and attended Princeton Theological Seminary, New Jersey, for one year on a Rockefeller Theological Fellowship. Ryan received an M.A. (1968) and Ph.D. (1972), both in speech, from the University of Illinois at Urbana-Champaign. 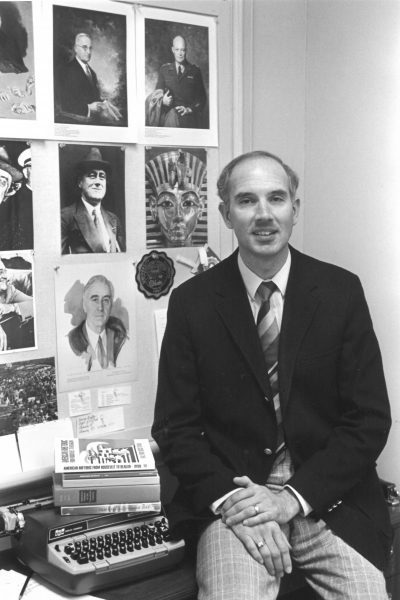 Ryan joined the W&L faculty in 1970 as an instructor of speech and debate coach. He became an assistant professor of English and speech in 1972, and retired in 2010 as a professor of English. He also served as a visiting professor of speech at the University of Virginia, Virginia Military Institute, and Sweet Briar College, and attended a National Endowment for the Humanities Summer Seminar at the Ohio State University. At W&L, he taught such courses as American Public Address, Classical Rhetoric, Principles of Public Speaking, Feminist Rhetoric, and the Oratory of the Old South. Ryan was active in the Virginia Forensics Association, serving as president and as editor of its newsletter. He belonged to Delta Sigma Rho-Tau Kappa Alpha, the collegiate honor society of forensics, serving as governor of Region III. He also directed and organized many debate tournaments, including the Bicentennial Youth Debates. Ryan wrote six books (including “Henry Ward Beecher: Peripatetic Preacher”), co-edited two (including “American Orators of the Twentieth Century: Critical Studies and Sources”), and edited four (including “Contemporary American Public Discourse”). He published 15 articles in nationally refereed journals, including the Virginia Journal of Education and the 1972 Free Speech Yearbook. He contributed six chapters to scholarly books, wrote numerous book reviews, and presented many papers at conventions. He served as editor of the Virginia Journal of Communication and the National Forensic Journal. He also served as co-editor/co-advisor of Greenwood Press’s Great American Orators Series. One of Ryan’s former students, Ross Singletary ’89, donated funds in his honor for an oral communications initiative in the Williams School. Singletary credited Ryan with helping him grasp the importance of good oral communications skills to personal and professional success. Halford is survived by Cheryl, his wife of 47 years, of Lexington; their daughter, Shawn; Shawn’s husband, Carsten Scharlemann; and two grandchildren, Cara and Eric.